B.A. / B.Sc. / B.Com. / B.B.A. / B.C.A./ B.Sc.B.Ed / B.A.B.Ed./B.F.A/ B.Pharm./ B.Lib.I.Sc./B.J./ B.A.LL.B. (Hons) (5 Years)/ LL.B. M.Sc. : Anthropology, Botany, Chemistry, Forensic Science, Geography, Mathematics, Physics, Zoology, Psychology, Yogic Science, Applied Microbiology and Biotechnology. M.Com. , MBA. , M.Lib.I.Sc., LL.M. , M.Ed. , M.J., M.Pharm. , M.Tech. (Applied Geology) and M.C.A. B.A. / B.Sc. / B.Com. / B.B.A. / B.C.A./ B.Sc.B.Ed / B.A.B.Ed./B.F.A. : Age should not be more than 22 years in case of Unreserved (UR) / OBC Category and 27 years in case of applicants of SC, ST and PWD categories as on 1st July 2019. B.Pharm. : The minimum age limit shall be 17 years on or before 30th June 2019. Age should not be more than 22 years in case of Unreserved (UR) / OBC Category and 27 years in case of applicants of SC, ST and PWD categories as on 1st July 2019. B.Lib.I.Sc./B.J. The maximum age limit shall be 30 years in case of Unreserved (UR) / OBC Category and 35 years in case of applicants of SC, ST and PWD categories as on 1st July 2019. B.A.LL.B. (Hons) (10 Semesters/5 Years): There is no age restriction for this programme. Because the Hon‟ble Supreme Court of India stayed the notification issued by the Bar Council of India prescribing the age limit for admission on 3rd March 2017. The age limit is subject to the decision of the Supreme Court or the directions of the Bar Council of India in this regard. LL.B. (6 Semesters/3 Years): There is no age restriction for this programme. Because, the Hon‟ble Supreme Court of India stayed the notification issued by the Bar Council of India prescribing the age limit for admission on 3rd March 2017. The age limit is subject to the decision of the Supreme Court or the directions of the Bar Council of India in this regard. B.A./ B.Com./ B.B.A.(Hons. )/ B.Sc./ B.C.A./ B.A.B.Ed. & B.Sc.B.Ed. Integrated /Bachelor of Fine Arts (B.F.A. ): Candidates seeking admission in the above-mentioned undergraduate programmes must have passed 10+2 or equivalent examination from a recognized Board/Institution. Candidates belonging to Unreserved (UR) and OBC categories must have secured at least 45% marks in aggregate or equivalent CGPA or equivalent grade in the qualifying examination. Relaxation of 5% marks in the qualifying examination will be given to candidates belonging to SC, ST and PWD categories in all the programmes. B.Pharm. Candidates seeking admission to this Programme must have passed 10+2 or equivalent examination passed with minimum 45%marks or equivalent CGPA or equivalent Grade with English as one of the subjects and Physics, Chemistry, Mathematics/Biology. Relaxation of 5% marks in the qualifying examination will be given to candidates belonging to SC, ST and PWD categories . B.A.LL.B. (Hons.) (10 Semesters/5 Years): Candidates seeking admission to this programme must have passed 10+2 or equivalent examination as a regular student from a recognized Board/Institution. Candidates belonging to Unreserved (UR) and OBC categories must have secured at least 45% marks in aggregate or equivalent CGPA in the qualifying examination. Relaxation of 5% marks in the qualifying examination will be given to candidates belonging to SC and ST categories in this programme. LL.B. (6 Semesters/3 Years): Candidates seeking admission to this programme must have passed 10+2+3 or an equivalent examination as a regular student from a recognized University or Institution. Candidates belonging to Unreserved (UR) and OBC categories must have secured at least 45% marks in aggregate or equivalent CGPA or equivalent grade in qualifying examination. Relaxation of 5% marks in the qualifying examination will be given to candidates belonging to SC and ST categories in this programme. B.J. (2 Semesters/1Year): Candidates seeking admission to this programme must have passed 10+2+3 or equivalent examination from a recognized University or Institution. Candidates belonging to Unreserved (UR) and OBC categories must have secured atleast 45% marks in aggregate or equivalent CGPA or equivalent grade in qualifying examination. Relaxation of 5% marks in the qualifying examination will be given to candidates belonging to SC, ST and PWD categories in this programme. B.Lib.I.Sc. : Candidates seeking admission to this programme must have passed 10+2+3 or equivalent examination from a recognized University or Institution. Candidates belonging to Unreserved (UR) and OBC categories must have secured at least 50% marks in aggregate or equivalent CGPA or equivalent grade in the qualifying examination. Relaxation of 5% marks in qualifying examination will be given to candidates belonging to SC, ST and PWD categories in this programme. For M.A./ M.Sc./ M.Com./ M.B.A./ M.Pharm./ M.Tech (Applied Geology)/ M.C.A./ M.P.A. (Performing arts), the maximum age limit will be 27 years for unreserved category (UR) and OBC candidates, and 32 years for candidates belonging to SC, ST and PWD categories on 1st July 2019. For M.J./ M.Lib.I.Sc./ M.Ed./ LL.M./ M.A. in Rural Development/ M.A./ M.Sc. in Yogic Science, the maximum age limit will be 35 years for Unreserved category (UR) and OBC candidates and 40 years for candidates belonging to SC, ST and PWD categories on 1st July 2019. There will be no age bar for serving Defense Personnels who have been permitted for study leave. (Except in the programmes for which age limit is prescribed by the regulatory bodies). M.Sc./ M.A./ M.Com./ M.B.A./ M.J./ M.S.W./ M.P.A. (Theatre Arts): Candidates seeking admission to any of the above PG programmes must have passed 10+2+3 or equivalent examination (as mentioned in Table -2). Candidates belonging to Unreserved (UR) and OBC categories must have secured at least 45% marks or equivalent CGPA. Relaxation of 5% marks in the qualifying examination will be given to the candidates belonging to SC, ST and PWD categories in all these programmes. M.Tech. (Applied Geology): Candidates seeking admission to this programme should have graduation with Geology as one of the subjects under 10+2+3 pattern with an aggregate of 45% marks or equivalent CGPA in the qualifying examination. Relaxation of 5 % marks in the qualifying examination will be given to the candidates belonging to SC, ST and PWD categories in this programme. M. Pharm. : Candidates seeking admission to this programme should be graduated in B.Pharm. with 55% or equivalent CGPA and valid GPAT/GATE score. Relaxation of 5% marks in the qualifying examination will be given to the candidates belonging to SC/ST/PWD categories. The candidates should have Registration with respective State Pharmacy Council or should obtain same within 2 months from the date of Admission failing which the admission shall stands automatically cancelled. M.C.A. : Candidates seeking admission to this programme should have graduation with one subject as Mathematics at 10+2 level. The candidate should have passed with at least 50% marks or equivalent CGPA in their graduation in any discipline. Relaxation of 5% marks in qualifying examination will be given to candidates belonging to SC, ST and PWD categories in this programme (Refer Table No. 2) from any UGC / AICTE approved Indian University or a Foreign University recognized by Association of Indian University (AIU) or Institute recognized by the concerned University as equivalent thereto. LL.M: Candidate must have passed LL.B. 3-Years after graduation under 10+2+3 pattern or five years LL.B. under 10+2+5 pattern duly recognized by the Bar Council of India and have secured a minimum of 50% marks or equivalent CGPA in the LL.B. Degree. Relaxation of 5% marks in the qualifying examination will be given to the candidates belonging to SC, ST and PWD categories for the admission in this programme. M.Ed. : Candidates seeking admission to this programme should have passed B.Ed./B.A.B.Ed./ B.Sc.B.Ed/ B.El.Ed./ D.El.Ed with minimum 50% of marks or equivalent CGPA. As per the revised AICTE regulations 2014, relaxation of 5% marks in the qualifying examination will be given to the candidates belonging to SC, ST and PWD categories for the admission in this programme. M.Lib.I.Sc. : Candidates seeking admission to M.Lib.I.Sc. must have secured 50% marks both in graduation as well as in B.Lib.I.Sc. Examination or equivalent CGPA. Relaxation of 5% marks in the qualifying examination will be given to candidates belonging to SC, ST and PWD categories for the admission in this programme. As per Govt. of India rules benefit of reservation shall be given only to those sections which are listed in the central list published by the Govt. 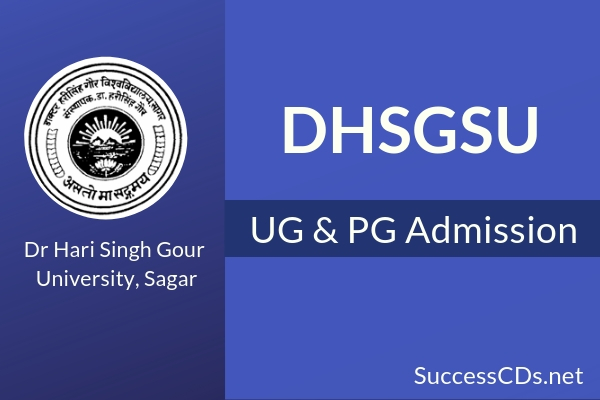 Admissions in UG and PG Programs will be given according to the merit in UGET and PGET subject to verification of eligibility in the particular program during counselling.